The Unity Sand Ceremony Wedding Hourglass case is hand polished after the personalized messages of your choice have been laser engraved on the end-caps. B - T & K Young sand. C - Send more informantion please. I will send your unity sand ceremony kit to arrive 2 to 4 weeks before the wedding date. Included in the unity sand ceremony kit are: An empty piece of unmounted hourglass for my 9" high 309 hourglass case, a stand to support the glass during your Unity Sand Ceremony, and a funnel. If you select A-My sand and will be using your own sand your kit will also contain a pair of empty clear plastic bottles. If you select B-T & K Young sand your kit will include a pair of clear plastic bottles filled with pre-sieved natural silica sand - 1 bottle each of white and wheat colored sand. The sand that I provide in the Unity Sand Ceremony Kit is natural in color. My white sand comes from Illinois and the wheat colored sand is from Wisconsin. I do not offer sand in any other colors. You will, however, find that colored sand is available locally from retailers such as Hobby Lobby, Michaels and others. This will allow you to see colors in person helping to match colors to your theme. Additional charges will apply for shipping to destinations outside the Continental United States. When you return the unity sand ceremony kit shipping charges must be pre-paid. 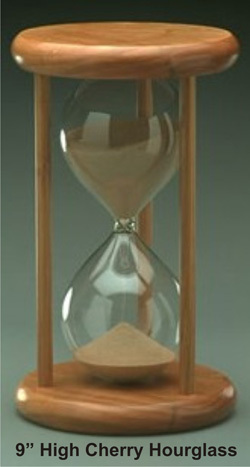 Please allow a minimum of 30 days for production time after I receive the unity sand ceremony kit and the approval for the laser sample made according to your personalized laser engraving instructions before I will be able to complete and ship your Unity Sand Ceremony Wedding Hourglass back to you.